What's up with the German megabrewers - have they forgotten how to handle hops and malt? It seems that way at times. Give them a recipe - preferably for Pilsner or Weizen - and they'll turn out a well-made beer. Then tell them that they have to economise and spend less on hops and malt, and they'll find ways to still brew a Pils that's just about sessionable in an unchallenging middle-of-the-road fashion. But ask them to go off-piste, to do something that's not in their recipe book, and they're a bit lost. Other worries for the megabrewers must be that smaller local breweries and brewpubs are doing nicely with tastier beers, and - horror of horrors! - some people are even drinking American and American-inspired pale ales and IPAs. So some of them have been scrabbling around for a response to this demand for extra flavour. At least, that's the most obvious reason I can think of for the appearance late last year and then again quite recently of two new "double hopped" Pilsners, both of which take a clear aim at Nordisch Pilsner but don't really hit the target. 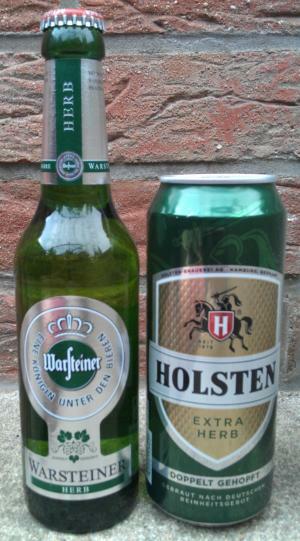 Test-launched in cans last December, and now back as a regular but this time in bottles, Holsten Extra Herb (Extra Bitter) boasts 40 IBU (international bittering units) as against 28 for the ordinary Pilsner. By comparison Sierra Nevada Pale Ale, which is distributed in northern Germany and is pretty popular among aficionados, is 38 IBU, while Jever is reputedly 44 and Pilsner Urquell is about 45. The original canned version was actually rather good for a megabrew woith a good balance of malt and fruity-floral hops, perhaps resembling an American Pale Ale (APA) as much as a Nordisch Pilsner. However, something's happened to the mass production version to render it much less impressive - attack of the accountants, methinks... Gone is the extra flavour, and it's just a bitter Pilsner now. 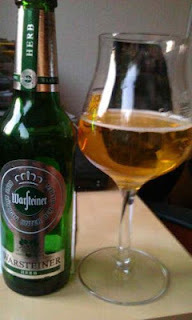 December also saw the launch of Warsteiner Herb, for which no IBU figure is given, but they write of adding "a significantly greater amount of Hallertau hops" during the boil. The result is rather one-dimensional - sure, there are dry-grassy hop notes and a bit of malt, but again all they've really done is add bitterness. The problem is that IBUs are only part of the story, and bitterness on its own is actually rather boring - HopHeads may disagree at this point, but hear me out! Bitterness needs to be balanced by other elements in the beer, as Sierra Nevada and Pilsner Urquell know and demonstrate. Otherwise it becomes harsh, often with the acrid vegetal note that the Warsteiner has, for example. So perhaps it's the way big brews work: maybe it's an issue with the process of scaling up from a pilot brew to mass production - though I don't know why Sierra Nevada and PU can do it but the Germans can't. Anyone got any ideas? Or am I talking bollards here? Do note by the way that not all beers labelled Herb are recently introduced over-bittered Pilsners. Most are simply German-style Pilsners, probably given that name to distinguish them from less hoppy styles such as Helles.